ARKON offers the most extensive assortment of high quality mounting solutions designed specifically for the Tomtom GO 520 / 530 / 630 / 720 / 730 / 920 / 920T / 930 portable GPS navigation devices. For detailed product information, specifications, and installation instructions, please click on the USER MANUAL links below before choosing your selection. 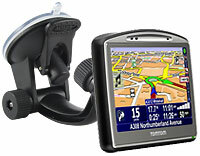 Tomtom GO 520 / 720 / 920 / 920P. Tomtom GO 520 / 720 / 920 / 920P Slide In Pattern. This page only offers Arkon car mounts for the Tomtom GO 520 / 530 / 630 / 720 / 730 / 920 / 920T / 930 GPS devices. Arkon's APTTGO520 easily converts ANY Arkon Dual T Tab pedestal pattern into the slot on the back of the Tomtom GO 520, 720, and 920 GPS navigation devices. Compatible with Arkon's CM014, GN014, GN115, TTO115, TTOXL115, TT115, PTM115, and BBP115 series. Central to the design of Arkon's new GN032-SBH handlebar mount is the compatibility with bicycle and motorcycle sized handlebars. Innovative design allows you to remove top portion of the mount, thereby leaving just the adhesive base on the dash. This feature may help prevent theft as your device is not readily visible. Ideal for use with portable GPS devices that use Arkon's Dual T slot pattern like All Magellan RoadMate etc A high-performance, low-cost 7" economical windshield suction pedestal The must have accessory for your Garmin, TomTom, Magellan, or other portable GPS.